Who wants a robot? Raise your hand. Open source robotics received a huge boost in momentum last Friday. Willow Garage, one of the driving forces behind the Robot Operating System, announced that it would be giving away ten of its new and extraordinary PR2 Beta Robots. The PR2 line achieved wide-spread notoriety in 2009 with its ability to plug itself into a wall outlet and recharge itself. Each PR2 Beta is a highly valued and expensive machine that represents a unique entry point to world-class robotics research. Willow Garage has an open call for proposals, so that any research group on the planet can apply to receive one of the PR2 Betas completely free of charge. That’s right, Willow Garage is giving these robots away for free. Applicants will have to release their research with the PR2 freely and under standard open source agreements. In this way, Willow Garage is accelerating the field of robotics, not just by making their PR2 Betas available, but by encouraging the shared development of robots and advocating the open source creed. If you were a robotics developer, why would you want to apply for Willow Garage’s deal? 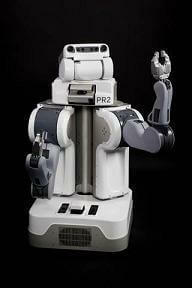 For starters, the PR2 robot is a high quality machine. It has two sophisticated arms capable of grasping, lifting, and coordinated work. It can also see what it’s doing. According to its specs, it has two laser scanners, half a dozen cameras, and arrays of other sensors. Just as important as the hardware, however, is the software. PR2 is fully compliant with ROS, and other open source robotics code supplied by a vast community robotics experts. 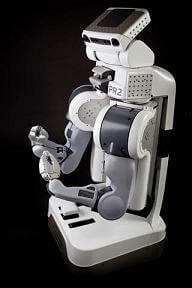 In short, the PR2 Beta is a robot that any researcher would be proud to use in their lab. Gaining one through Willow Garage’s offer is akin to shaving years off of a research program. Instead of developing hardware themselves, successful applicants will be able to focus on the really cool part of their jobs: getting robots to do their bidding. Willow Garage is in essence facilitating the rapid development of useful robotics protocols. The ten research groups who receive the PR2 will help build a growing library of programs which any developer can use in their own efforts to build better robots. Did you find out a great way for a robot to identify water? Well share that with another researcher and they’ll figure out to make the robot drink. That’s the power of open source robotics. What can't I do with these hands? For their part, Willow Garage is using their selection criteria to further their vision of robot development. Foremost is the emphasis on open source, but WG is also giving preference to those research teams that do not rely on military funding and that avoid military uses of their work. After being selected, a PR2 recipient will also be pulled into several community building exercises. Of course all code will have to be shared in communal ways, but there’s also going to be regular round table meetings, and teams will be encouraged to share their experiences via blogs or public forums. Sometimes it seems that Willow Garage is going to drag the field of robotics into the open source community kicking and screaming if need be. Certainly they’ve leveraged this give-away to further shared robotics research in the short term (by giving each group a robot) and in the long term (by strengthening the open source robotics community). If the application process goes well, and the recipient groups produce some really amazing research in the next few years, this program could be repeated not only by Willow Garage, but by other major robotics labs across the world. I am thrilled by the possibility that WG could start a trend by which research groups with a lot of promise, but not a lot of funding, could compete at the highest tiers of robotics through the donation of specially developed research robots. The more groups working towards the same goal, the quicker we’ll achieve some amazing results. To me, this program is really what Willow Garage has always been driving towards. They’re going to further the field of robotics not just by building better robots, but by developing the global infrastructure through which other teams can build better robots. I can’t wait to see who is chosen and what they do with their PR2 Betas. Willow Garage announced its call for proposals on January 15th, and candidates only have until February 1st to send in their letters of intent. Formal proposals are on March 1st, and by April we’ll all know which teams have been selected to receive the PR2 Betas. Officially the announced number of robots to be delivered is “around 10”, so there may be some deviation if too few (or too many) worthy groups are found. If you’re a robotic engineer with a proven history of research in the field, you can learn more by reading WG’s proposal form.